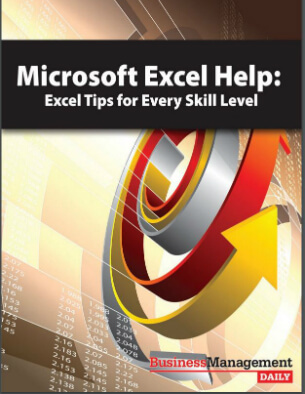 Claim your FREE copy of Microsoft Excel Help: Excel Tips for Every Skill Level ! There’s no need for Excel to be a frustrating application to use. You can look forward to working in it and take your proficiency beyond the basics to the next level. That’s why we’ve compiled this summary of our popular Microsoft Excel tutorial, The Microsoft Excel Training Series, presented by Melissa P. Esquibel, a Microsoft® Certified Trainer. Melissa combines her 25+ years of experience in information technology with a background in training, technical writing and business risk analysis. Her goal is to move you beyond just typing data into cells and really make Excel do the work for you. With this Microsoft Excel Help summary, you can hone your skills, boost productivity and advance your career-no matter which version of Excel you use or your level of experience. We’re going to introduce you to several really great keyboard shortcuts that help keep your hands on the keyboard rather than wasting time using the mouse. We’ll also cover ways to work with worksheets that make storing related information in one workbook the time-saver it’s supposed to be. Then you’ll learn a couple of ways to minimize the amount of typing you have to do-even fast typists will appreciate those. We’ll also introduce you to templates as a way to do the hard work once instead of over and over again. Finally, we’ll explain some ways to solve problems with formulas and what to do when the formula is the problem. Refocusing on the screen and performing the action. Instead, you could be using two time-savers: Alt key shortcuts and Ctrl key shortcuts. In this report, you’ll learn how to search for, find and open files with these quick keyboard shortcuts… Knowing Alt key shortcuts can also help if the mouse stops working for whatever reason. You will be able to save your work and close files gracefully before you reboot. Another very useful set of shortcuts are the Ctrl key shortcuts and Function keys. Many of us are already using one or more of these. For example, if you do a lot of copying and pasting, you probably use Ctrl C and Ctrl V for Copy and Paste. Jot three or four shortcuts on a Post-it note and place it on your monitor for seven days. Begin using those shortcuts whenever you think of it. You may be tempted to take it down sooner than seven days, but don’t. It takes that much time to find a place to live in your brain. Then when you have those down pat, do another three or four. Within a month you can add up to a dozen new shortcuts to your toolbox. You will not only save time, but also improve your accuracy. Good typists know that the more you can keep your fingers on the home keys, the more accurate your typing and data entry will be. Ctrl Z: Undo 16 actions! Let’s look at another shortcut: Ctrl Z. Did you know that in version 2003, you can undo back 16 actions? Yes! By pressing Ctrl Z, you can undo each of the last 16 actions you performed, with a few exceptions. (In 2007, it’s 100 actions!) The exception would be any File Open or Save actions and any worksheet actions. So, until you save your file, the system stores all your keyboard actions back to the last 16, which you can then undo by pressing Ctrl Z for as many actions as you want. In this colorful and informative free Special Report, we’ll take a look at fast and easy ways to work with worksheets. One of the most common frustrations in Excel is sizing rows and columns accurately. We have columns that are not wide enough to show all the numbers-that’s what all those pound signs mean. We also have columns that are too wide, rows that are too short and rows that are too tall. If I asked you to straighten this out, many of you would start imagining all the clicking, dragging and adjusting. But, there’s a faster way … a MUCH faster way. One technique with Zoom that you might find useful is Zoom by Selection when you want to look only at a particular part of data. We could choose it, click on the drop-down arrow to the right of the zoom percentage number and select Selection.Excel will optimize the zoom to enhance that selection of data as large as it can, keeping it all on screen. The upper limit is 400%. Again, select the data you want to see clearly on the screen, click the drop-down arrow next to the zoom percentage and select Selection. There are two ways you can cut down on typing in Excel: using AutoCorrect or AutoFill. AutoCorrect is applicable across all Office applications. In Excel, it’s under the Tools Menu – AutoCorrect. What kinds of long strings do you have in your world that could be abbreviated into an AutoCorrect option? Now, you’ll want to be careful about what you choose. For example, you wouldn’t want to use “t h e” for Tom Harris Enterprises. Every time you typed “the” you’d get Tom Harris Enterprises. Don’t be afraid to attach symbols the way we did with the hyphen. And, a good rule to remember is: If you enter it in AutoCorrect as lower case, the case doesn’t matter. But if you type it upper case, only upper case works. Next, let’s look at AutoFill. Many of you are already using AutoFill to drag formulas down a column. And, remember, if there’s data on the left, all you have to do is double-click. The way you know you are on the AutoFill handle is that your cursor changes from a white plus to a black plus. Have you ever tried to type in a numbered list? All you get is a bunch of 1’s. If you are using version 2003 or 2007, all you have to do is click the little AutoFill Options box and select Fill Series. If you are using an older version and don’t see that AutoFill Options box after you click AutoFill, just type in the first two numbers in the series, like 1 and 2. Then select them both and use the AutoFill Handle on the second one and drag it down. This works for any type of number series. Let’s say you wanted a list of interest rates, like 6%, 6.5% on up to 10% by half percents. You would type in 6%, 6.5% and click and drag them. One other AutoFill tip I want to share with you is the Custom List. Take a few moments and jot down some ideas for using custom lists: department names, location names. One chemist I know used a four-character identifier for chemical combinations-you know how long some of those names can be. All he had to do is remember the four-character code. What else can you think of? How about team members’ names? A great deal of time is spent on period tasks with the exercise called “Now how did I do that last time?” Or there’s this other exercise: You bring up last week’s or last month’s or last year’s version, delete all the data, being very careful not to delete those formulas, save it under a new name and enter the new data. And, of course, we never accidentally delete the formulas, right? Oh, and we never forget to save it under a new name because that would mean we’d have to do the previous version over again and then do the new one. Do you see the potential for wasted time here? To explain what templates are, let’s take a trip back in time, way back to when we first got fax machines. Some of you might not remember a world before fax machines, but bear with me. Someone had the bright idea to create a fax coversheet, put it in a plastic sleeve and write on the sleeve: DO NOT WRITE ON THIS SHEET. You were meant to make a copy of it and put the master copy back. That way, each time you needed a new fax coversheet you’d just make a copy of the one in the sleeve. Templates in Microsoft Office work the same way. For those who are very new to Excel, let me share this bit of wisdom: A blank is the worst place to start an Excel project. By all means, search templates first, see if there is something close to what you want to make. There’s no reason to start from scratch. Check out templates first. Learn how to access and build your own custom templates for repeated success — everytime! The last topic we’ll cover is Formulas. We’ll look at this two ways: how to troubleshoot formulas and how to use formulas to fix problems. One of the most frustrating tasks is when you inherit a workbook from someone else, you touch one thing and the whole thing breaks. It would be nice if you knew which cells had formulas in them and which just had numbers. We could just click into each and every cell and see which ones had formulas, but it would be easier to see them all at once. Another way to get help with formulas is to look at the formula tip tool-that little strip that shows up underneath the formula when the cell is in edit mode. Let’s look at this IF statement. The formula tip tool tells us how each part of this formula relates to the syntax of an IF statement. Even better, if you click into a cell and you don’t know what an IF statement is even for, you can click on the IF part of the tool tip and get extensive help text on the subject. The best part of this method is that it leaves you in the cell you were in when you asked for help. Try this out on your own data! Download this valuable report today!